The specific objectives of the evaluation were to provide clear and documented information resulting from the Rope Pump pilot project that will assist the country WASH sector in making an informed decision on adoption or not of the Pope Pump as a national standard pump for up streaming groundwater from the shallow aquifer. The Water and Sanitation Working Group (GAS), as part of its assistance for research and development of alternative technology options for rural water supply, supports the National Water Directorate on the implementation of different pilot projects for testing the development and production of the rope pump in Mozambique. 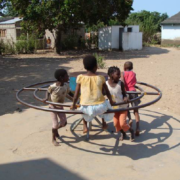 In this regard, the MOPH-DNA approved and authorized the implementation of the “Projecto Piloto de Introduçao da Bomba de Corda em Moçambique in 2005”. Under the leadership of DNA/DAR and with support from SDC, CARE, UNICEF, WaterAid, (GAS members) three provinces, namely Cabo Delgado, Niassa and Zambézia were selected to be involved in production and testing of the rope pump through the local private sector. To ensure effective project technical support, monitoring and evaluation of the performance of the pumps and the manufacturers, the GAS group through its Rope Pump sub-group had established a Technical Team comprising of representatives of CFPAS, LEM and SKAT.